Nalanda University (Skt. Nālandā, Tib. ནཱ་ལེནྡྲ་, Wyl. 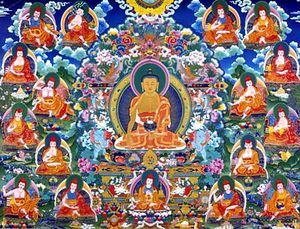 nA len+d+ra) was the largest and most famous of the ancient Indian monastic universities, and is associated with some of the greatest figures in Mahayana Buddhism. In its heyday, it was home to some ten thousand students who gained admission only after successfully answering a serious of philosophical questions put to them by scholar-gatekeepers. It is located in what is now the state of Bihar, India. Nalanda is mentioned in the sutras as a place where the Buddha often taught. Although some viharas may have been built on the site in the centuries after the Buddha's parinirvana, it is now generally agreed that the founding of the great university dates back to the reign of the Gupta king Kumaragupta I, who ruled from 415 to 455 and is referred to as Shakraditya (Śakrāditya) in many sources. Several monasteries were constructed on the site during the Gupta period, and at some point, possibly during the sixth century, they were enclosed within a wall with a single gate. By the time the Chinese pilgrim Hsüan-tsang visited in the seventh century, entrance to the university could only be gained by those who passed the admission test put to them by learned gatekeepers. Hsüan-tsang stayed for a period of about six years, during which he studied Yogachara philosophy. I-tsing (635-713), another Chinese pilgrim, who visited after Hsüan-tsang and stayed for about ten years, reports that there were about 3500 monks in residence at that time. The biography of Chak Lotsawa explains how he visited the site, then largely in ruins, in 1235 AD. While there, he studied with the master Rahula Shribhadra, a specialist in Sanskrit grammar who was in his nineties and was teaching a class of about seventy students. The biography includes a moving account of how, on one occasion, the lotsawa was forced to carry his aged teacher on his back in order to flee a band of 300 Muslim soldiers after everyone else had fled the monastery. The lecture halls cover many acres of land lined up along a long road that divides the teaching area from the adjoining temples. Along the edge of each lecture hall were rooms for the monks and their teachers. What remains is for the most part no more than several meters high, but the plan of the monasteries is still clearly in evidence. One of the most prominent features of the Nalanda University ruins is the stupa built in honor of Shariputra, who, by tradition, was born and also died in the area. Jetsun Taranatha explains that Nalanda is the place where Shariputra was born and attained arhathood. According to a prophecy the Mahayana teachings would spread greatly if they were taught at the place of Shariputra, but if taught at the place of Maudgalyayana although the Buddhists would be very powerful, the teachings would not spread as widely. The great library of Nalanda University was so vast that it is reported to have burned for three months after the Muslim invaders set fire to it, sacked and destroyed the monasteries, and drove the monks from the site. The curriculum at Nalanda consisted not only of Hinayana and Mahayana philosophy but also medicine, logic, astrology, and many other subjects as well. Nalendra Monastery, founded by Rongtön Sheja Kunrig in 1436, was named after Nalanda, reflecting a common Tibetan spelling of the word. His Holiness the Dalai Lama rarely starts a teaching without mentioning that it is in the "great tradition of Nalanda University". This page was last edited on 13 September 2018, at 21:34.